You might not think there’s much to do in the garden during the long, cold and generally dreary months of the winter when you’d rather be indoors anyway and keeping warm. And apart from a bit of a tidy-up to collect fallen leaves and branches, that’s probably true. For the many homeowners across the UK afflicted by the scourge of Japanese knotweed, however, it might be a different story. A new survey shows that close to a million homes around Britain are blighted by this highly invasive weed, which was originally brought into the UK in the 1800s as a decorative plant. The survey, carried out on behalf of leading Japanese knotweed removal firm Environet, reveals that given the average property price of £228,000, as much as £20 billion has been collectively slashed off the value of UK homes because of issues created by the weed. To get a visual impression of the scale of the problem, go to the PlantTracker website and you’ll see that almost no part of Britain is left unaffected by Japanese knotweed. Hotspots appear on the site’s map of verified cases of infestation in all four countries of the United Kingdom, with large clusters in the southwest and southeast of England, Wales, northern England, southern Scotland and areas of Northern Ireland. 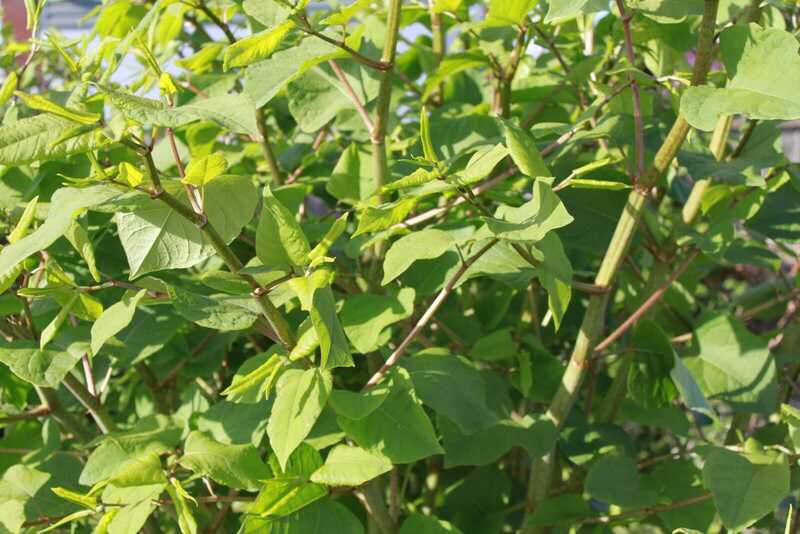 Many people only start to realise they have Japanese knotweed in their garden or elsewhere on their property when it suddenly appears and starts to grow like wildfire. It can grow up to 20 cm in a single day during the spring and summer, and can quickly overwhelm all other plants unless it’s swiftly dealt with. Just cutting it back doesn’t get rid of this entrenched problem, however, because no matter how hard you try to slash it back to the ground, it will most likely just keep on sprouting new shoots and growing. Underground is where the real difficulty with Japanese knotweed lies. It has a large, deep and extensive root system, which fuels its seemingly voracious appetite. And while the shoots above ground are creating havoc, down below there’s a different and potentially more devastating scene unfolding. The roots can work their way into cracks in walls, for instance, and expand as they get bigger — leading to serious structural problems with buildings. They can also interfere with underground piping, such as water and sewerage, and cause even more damage. All this is why it’s almost impossible to sell a house with Japanese knotweed somewhere on the property, or get a mortgage for one. Mortgage providers will typically require that Japanese knotweed removal first be carried out by an expert company. Then there are legal issues associated with disposing of Japanese knotweed and letting it spread to neighbouring properties, including the possibility of being given an ASBO. It’s tempting to try to deal with Japanese knotweed yourself, as many people just think: “It’s only a weed — how hard can be it to get rid of it?” Sadly, the answer to that question is found many months and perhaps even years down the line, when after spending lots of time, money and effort on trying to kill off this beast of a plant, you’re back to square one because it keeps on growing. The only real solution is to get in a professional Japanese knotweed removal firm that will get right to the root of the problem and ensure there is nothing left — above and below ground — to start growing and cause trouble all over again. This can be done with powerful herbicides over a number of growing seasons or a full dig-out of the infested site — the best Japanese knotweed removal firms will usually also provide a guarantee for up to a decade. Because Japanese knotweed dies off during the winter, now is the perfect time to deal with the problem before it comes out of its hibernation in the spring. Then you’re all ready to get growing like never before, and with your home’s value and integrity protected.